Apart from a recent skincare hiccup (which I’ve been ranting about on twitter recently), my skin has actually been rather clear. 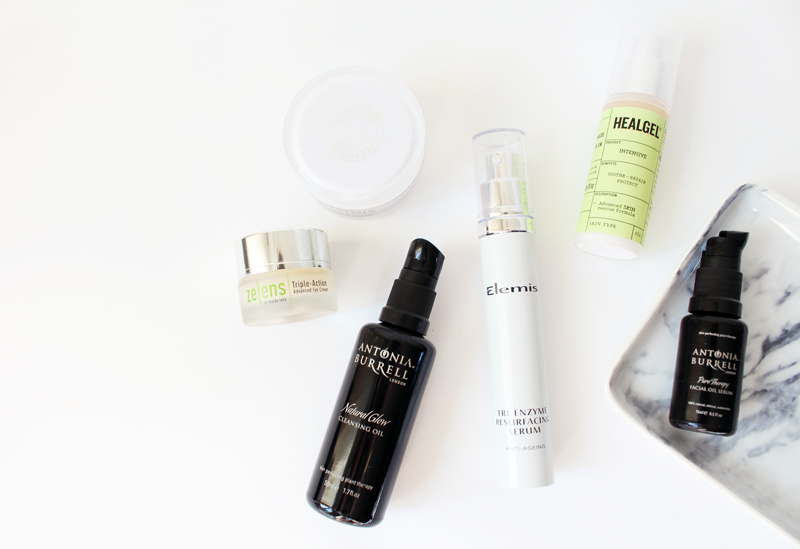 I’ve been sticking to a bit of a routine and it seems to have worked wonders, so I’ll do a quick rundown of the products that have been helping to improve my complexion. Starting with a cleanser, I’ve been suing the Antonia Burrell Natural Glow Cleansing Oil which melts off makeup so well. I really love using this as I feel like it purifies the skin, leaving it looking more radiant after use. Plus, it seems to get every scrap of my mascara off, so that’s a winner to me! Another product I’ve been using from the same range is the Antonia Burrell Pure Therapy Facial Oil Serum. I adore this facial oil, it’s worked its way into my top five as it’s done so much for my skin. It’s got quite a strong, natural scent but it helps heal up any blemishes and leaves skin with such a nice glow. Now, eye creams are something that I’m quite fussy about. I am cursed with dark circles, so finding one that actually helps is quite a challenge. For the past 3-4 weeks, I’ve been using the Zelens Triple-Action Advanced Eye Cream every day and it’s definitely one of my favourites. It might be pricey, but the texture is just so, so nice. It really soothes the eye area and my dark circles do seem to be better on a morning, which is all I want in an eye cream! Finally, as my skin has been playing up due to a product reaction, I’ve been using the HealGel Intensive to really restore my skin and get it back to normal. I love this lightweight serum, as it does work to repair skin and give it a bit of a boost. It’s a product I keep coming back to time and time again, as it never lets me down. What have you been loving recently? Oh, and make sure you enter my Rayban and beauty goodie bag giveaway – nearly £300 worth of items up for grabs.